The Robert company produces a product known as chemical X. In the production of chemical X, a by-product results which has a market value of $0.30 per liter at split-off point. The company is able to sell the by-product as is for $0.30 per liter or process it further and sell for $0.70 per liter. the by-product is stored without allocating it any cost and later sold to customers at $0.30 per liter without additional processing and without incurring any cost. the by-product is stored and costed at $0.30 per liter, reducing the cost of chemical X (i.e., main product) by the amount assigned to it. the by-product is processed further and stored without allocating it any cost prior to separation. the by-product is processed further and stored. The cost prior to separation is allocated to it using the market value method at split-off. 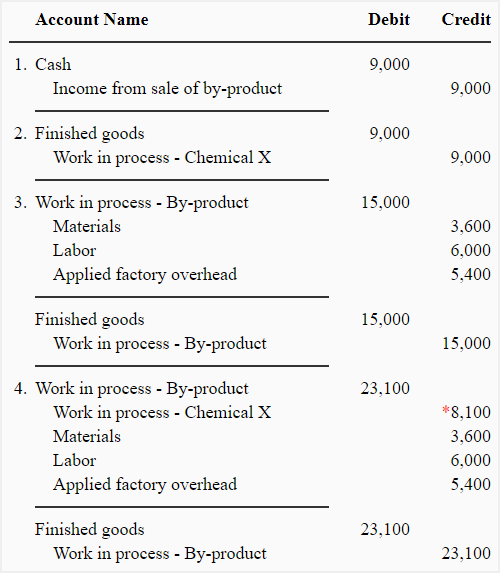 The cost of the chemical X (i.e., main product) is reduced by the amount allocated to the by-product. The market value of chemical X is $3.